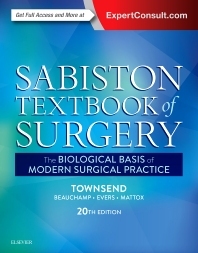 Since its first publication in 1936, Sabiston Textbook of Surgery has been regarded as the preeminent source for definitive guidance in all areas of general surgery. The 20th edition continues the rich tradition of quality that has made this classic text synonymous with the specialty and a part of generations of surgery residents and practitioners. Meticulously updated throughout, this classic text concisely covers the breadth of material needed for certification and practice of general surgery. Detailed, full-color intraoperative illustrations and high-quality video clips capture key teaching moments, allowing you to better understand the basic science of surgery, make the most informed decisions and achieve optimal outcomes for every patient. Understand the underlying science and its clinical application to make informed surgical decisions and achieve optimal outcomes. Overcome tough challenges, manage unusual situations, and avoid complications with the most trusted advice in your field. Get the depth of coverage you need in an easily accessible, single volume organized by organ and along traditional lines beginning with principles common to surgical specialties including fluid and electrolyte management, metabolic support, and wound healing. Subsequent sections review the management of injury, transplantation, oncology, breast, endocrine, and abdominal procedures. Explore topics encountered by general surgery residents in training as well as in-depth coverage of subspecialty areas including head and neck, thoracic, vascular, urology, neurosurgery, pediatrics, and gynecology. Visually grasp and retain difficult concepts thanks to a full-color design featuring an abundance of illustrations, intraoperative photographs, video clips and tables as well as more schematic diagrams that facilitate the comprehension of surgical techniques and procedures.